Angie Castle submitted this one. "This is a picture of me and friends from ageout night. This was my second and final year in Southwind's color guard. 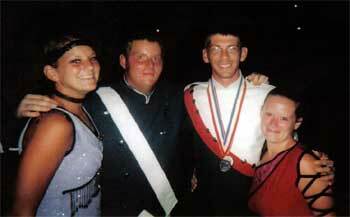 "In the picture are Nicole Estes (Phantom Regiment), Ryan Francis (Bluecoats), Denny Rust (East Coast Jazz) and me, Angie Castle (Southwind). That night was special to all of us because we currently march together in college at Morehead State University and, we got to ageout of DCI together. We will continue to march and be good friends." Thanks Angie! E-mail your best shots from the summer to dave@dci.org along with where and when the photo was taken. Send some biographical information about yourself as well. We'll give you full credit. Also, let us know if you want your e-mail address included.